Today’s robot vacuum review comparison is going to be looking at the Roomba 890 vs. 980. Both of these vacuum cleaners are top-of the line models, jam-packed with features, techy settings, and a futuristic feel. For a complete comparison, we look at all aspects of these vacuums, even testing them using our unique vacuum testing process. The Roomba 890 is the top model in Roomba’s 800 series. It strikes a nice balance between cost and capabilities. The 800 series offers some serious advancement over older models, like an improved filtration system and brushroll, as well as a full bin indicator. The 890 can be connected to a wifi network and operated from your smartphone or via Amazon Alexa or Google Assistant. AeroForce filtration system with advanced brushroll for less tangles and an improved, more efficient HEPA filter. The Roomba 890 is a little less than half the cost of the the Roomba 980 model. The dust bin design tends to spill a bit when you empty it. A relatively short run time and small battery, compared to the 980. The advanced brushrolls and wifi connectivity make this vacuum a real contender, in my opinion. The Roomba 980 is the most advanced robot vacuum of all of their current models. The 980 includes some special bonus features like recharge & resume (allows for longer cleaning cycles) and power boost (for carpeted floors) as well as advanced dirt detection technology. One of the most notable features may also be the on-board camera for improved navigation and memory-mapping. This camera helps Roomba remember your house. A larger capacity battery allows for approximately twice the run time (120 minutes) compared to the Roomba 890 model. Advanced power boost setting for carpet floors provides greater cleaning suction. Most expensive model that Roomba currently offers. Louder than the Roomba 890 during the low pile carpet or hardwood tests. The Roomba 980 offers the most features and highest cleaning performance of any other Roomba we’ve tested to date. If you want the absolute best and money is less of a concern, this is the robot vacuum for you. The look of the Roomba 890 returns back to a simple color scheme, using a combination of a matte black and glossy black for accents. The central “CLEAN” button allows for you to easily start a cleaning cycle, or start / schedule a cleaning from the iRobot Home app using your smartphone. The handle, bumper ring, and dust bin release are all consistently similar to previous Roomba models. The look of the Roomba 980 robot vacuum is similar in color to the 890, but has a different layout. Breaking away from the central “CLEAN” button, the 980 model makes the on-board camera center stage and the clean button relocated to a little higher up on the vacuum. As it runs a cycle, the 980 is continuously scanning the space, helping to avoid unnecessary bumps and navigational hiccups. The handle has also been redesigned here, while the bumper ring and dust bin release have the same look as before. The Roomba 890 cleans using infrared navigation technology, agitation, and suction. The dual brushrolls (or debris extractors) do a much better job of capturing debris, especially pet hair, and preventing tangles or hair being wrapped around the axle and causing a blockage. The Roomba 890 has basic dirt detection, helping it to identify especially dirty areas and spend extra time cleaning those spaces. 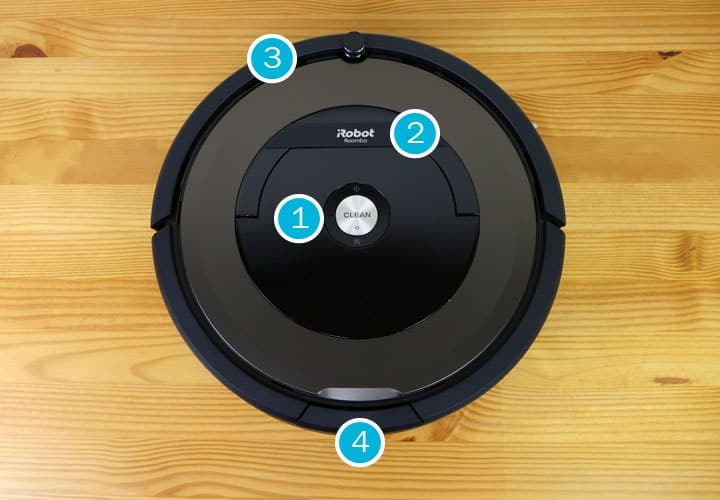 Edge sensors on the front of the vacuum help this Roomba to detect stairs, edges, or other areas that may pose a drop hazard. The Roomba 980 cleans using infrared navigation technology, agitation, and suction, similar to that of the 890. The 980 uses the advanced brushrolls as well and has a similar layout “under the hood”. Unlike the Roomba 890 which uses iAdapt 1.0 navigation technology, the 980 uses iAdapt 2.0 which cleans the space using straight paths and a little more logic. Another key difference to note is the addition of edge sensors on the backside of the robot vacuum. These additional sensors help the 980 to better understand its surroundings and improve navigation. The Roomba 890 is 13.9″ in diameter and 3.6″ high. Compared to the Roomba 980, this model is 0.1″ wider in diameter. The 890 models weights 8.4 pounds, 0.3 pounds lighter than the Roomba 980 model. The Roomba 980 is 13.8″ in diameter and 3.6″ high. This size is consistent across all 900 series Roombas, 0.1″ smaller in diameter than the 800 series models. This vacuum weighs 8.7 pounds. Virtual wall barrier — This advanced virtual wall uses an infrared light to block off zones that are not meant for Roomba. It can block a straight line, like a doorway, up to 10′ wide or a radius around a sensitive object, like a pet area, for up to 4′ in a radial pattern. Charging station — The charging station plugs into a standard wall outlet and is Roomba’s home base. When the battery gets low, the Roomba 890 will automatically return to the base to charge before the next cleaning cycle. HEPA Filter — This filter works with the AeroForce filtration system to remove microscopic debris and allergens from the air. Spinning brush (not shown) — This vacuum also includes the spinning brush, like on the 980, which helps to clean edges and corners. Charging station — The charging station is where the Roomba automatically goes when its batter gets low. The Recharge & Resume feature also allows the Roomba to clean until it needs to charge, return for some energy, and then return to its last known position to complete the cleaning cycle. Spinning brush — The spinning brush installs into underside of vacuum and works to sweep edges and corners free of debris. Virtual wall barriers (2) — The 980 comes with two virtual wall barriers, which helps Roomba to navigate larger homes and tricky spaces. HEPA filter — This HEPA filter works with the advanced AeroForce filtration system for top-of-the-line collection of fine particulate or allergens. RELATED – Looking for other vacuums? See our tests on upright vacuums, stick vacuums, and handheld vacuums also. On each of those floor types, we test rice, dry cereal, kitty litter, and sugar. For the robot vacuum cleaning tests, we allow the vacuums to clean for up to 15 minutes, or less time if it stops on its own. On hardwoods, the Roomba 890 did an excellent job— collecting 100% of debris for the rice, cereal, and sugar test. On the low pile carpet, the 890 continued to perform flawlessly on all tests, excluding the sugar. After the sugar test, 35% of debris remained in the carpet. The high pile carpet test was similar to the low pile carpet test. Results from cleaning up rice, cereal, and kitty litter were excellent while the sugar results continued to drop. On hardwoods, the 980 model had excellent cleaning performance, capturing 100% of all debris types. On the low pile carpet, cleaning performance was still excellent. The sugar test was the lowest volume at 89%, but it still captured 24% more debris than the 890 model. On the high pile carpet, the 980 began to struggle with the sugar debris, but all other debris tests (including rice, cereal, and kitty litter) remained at 100% capture rate. Setting up the Roomba 890 is extremely easy and daily usability is a breeze. Simply unbox, charge, and start a cleaning cycle by just pressing “CLEAN”. If you’d like to setup the wifi connection immediately, it takes only a few minutes to install the app and sync it with your vacuum. You can pair this vacuum with your smartphone, Amazon Alexa, or even Google Assistant. Setting up the Roomba 980 was equally as simple as setting up the 890. The 980 uses the same app for smartphone use and has the same “CLEAN” button, although it is in a slightly different location. The addition of a second virtual wall barriers does increase the usability, in my opinion, especially if your home has multiple tricky areas or a divided layout. The Roomba 890 has excellent maneuverability. 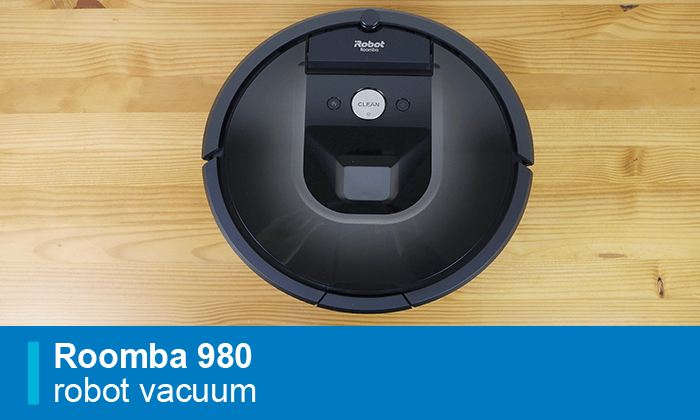 Similar to other Roomba, the 890 is built with the classic round body and 360° turning radiuscapabilities. The 890 does have memory mapping an an on-board camera which helps the vacuum to navigate larger areas. Memory mapping allows the 890 to remember where it has been and map the spaces it still needs to clean. This helps make sure that all areas are touched before returning back to the charging base. That being said, the 890 does use iAdapt 1.0 technology (unlike the 980 model) so cleaning path is a bit sporadic. The Roomba 980 also has really fantastic maneuverability. Once again, the round body style of the vacuum makes it easy to squeeze under furniture or around table legs. The 980 offers memory mapping and an advanced on-board camera. In addition to memory mapping, the 980 also offers digital map reports that detail out the Roomba’s path throughout the cleaning cycle. With this tool, you can accurately know where your Roomba has been and if it got held up in any areas. Lastly, the 980 model is equipped with Roomba’s iAdapt 2.0 navigation technology versus the 890 which is only outfitted with the iAdapt 1.0 technology. Visually iAdapt 2.0 makes more logical decisions and straighter paths, more similar to how your would actually vacuum. Maintenance for the Roomba 890 robot vacuum is pretty straight-forward and affordable, considering the overall cost of the vacuum. The cost to maintain the unit is around $34 / year. Daily maintenance includes emptying the dust bin and cleaning the filter. Occasionally, the actual cleaning brushes will need to be replaced, but this is easy to do and not extremely costly. Maintenance for the Roomba 980 robot vacuum is similar to the Roomba 890. The cost to maintain the unit is around $37 / year. While model numbers of replacement parts may vary, the replacement frequency and cost remains pretty consistent, fluctuating a couple dollars here and there. Replacement parts can be purchased from iRobot or third party sellers. The battery of the Roomba 890 can run for around 60 minutes. There is no Recharge & Resume on this model. For larger homes, you may need to run a shortened cycle using the virtual barrier to mark off extended areas of the home. Once complete, you can manually move the vacuum and begin a second cycle. The battery of the Roomba 980 can run for around 120 minutes, twice the run time of the Roomba 890. The Recharge & Resume feature allows the Roomba to return to its base, charge up, and then continue cleaning where it left off until the cycle is complete. To score noise, we use a decibel reader to measure how much noise the vacuum makes running at full power, approximately 3′ away from the user. Compared to the Roomba 980, the Roomba 890 was slightly quieter. We put all of our vacuums through a standard decibel noise test, where we figure out how much sound the vacuum emits running at full power, while standing approximately 3′ away. Compared to the Roomba 890, the Roomba 980 was slightly louder. Considering value, the Roomba 890 robot vacuum is well worth the cost, in my opinion. At around half the cost of the Roomba 980, the 890 model includes a lot of the major features, like the improved brushroll, wifi connectivity, voice control, cleaning performance, and accessories. This is a great vacuum for most homes that are looking for a quality clean. Additionally, the 890 has low maintenance costs.The parts that need replacing are relatively inexpensive and easy to install with a few simple tools. Regarding the nature of the iRobot company, we dug into their business a bit and did not find and red flags. Red flags would include participation in frivolous lawsuits, numerous consumer complaints, or questionable business practices. As for the value of the Roomba 980, I would say that it is still good, but not great, in my opinion. At the extra cost, I would have liked to see it clean a little better on the sugar test for high pile carpet, but overall cleaning performance was exceptional. This robot vacuum may be more valuable for consumers with larger homes or people who want a “set it and forget it” type of vacuumexperience. The 980 has multiple technologies in place that enhance its performance in larger or more spread out homes. The Power Boost cleaning mode and advanced dirt detection technology also equips this Roomba with the tools it needs to effectively locate and eliminate debris from anywhere in the home. Roomba 890 vs. 980, Which Should You Buy? Between the Roomba 890 vs 980, both robots offer top of the line cleaning performance. For the added cost, you really need to specifically be looking for these features in order to get the full benefit of the 980 model, in my opinion. For example, a small apartment with hardwoods might not necessarily require all of the snazzy bonuses of the Roomba 980. By the same token, if you have a large home with a complicated layout or especially messy environments (it’s ok, you can blame your kids), the Roomba 890 might not cut it. 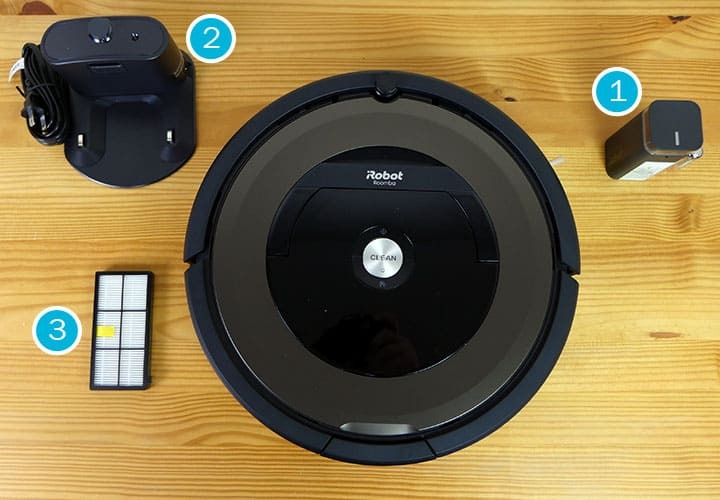 Check out the breakdown below of what exactly you’re paying for with the Roomba 980. Advanced navigation — The iAdapt 2.0 technology on the 980 model means straighter lines and a more logical cleaning path. The Roomba 890 uses iAdapt 1.0 which has a bit of a sporadic approach. Longer run time — The Roomba 980 can run up to 120 minutes on a single charge, while the Roomba 890 can only run for up to 60 minutes. Recharge & Resume technology — If it can’t get the job done in a 120 minute cleaning cycle, the 980 will return to the charge, juice up, and then get back to cleaning where it left off until the job is done. Power boost — When vacuuming carpets, the 980 models has a cleaning mode with stronger suction for dense carpet pile. Advanced dirt detection — This newer technology helps the Roomba to find dirt and eliminate it more effectively. Includes an additional virtual wall barrier — For larger homes, this additional virtual barrier helps Roomba to stay on task and keeps it out of spaces you don’t want it interfering with. GUIDE: Not sure either of these vacuums are right for you? Check out our Rooma Reviews page to see the entire Roomba lineup! Overall, the Roomba 890 is a solid option.Improved navigation and the improved AeroForce filtration system are real advancements between the 890 model and previous models. Also, the cleaning performance was nearly identical to that of the Roomba 980, with the main exception being the sugar test on low pile carpet. Want a lower price – If you want top-of-the-line features, but don’t want to pay top-dollar, the Roomba 890 is a great option, being roughly half the price of the Roomba 980. You do miss out on a few features from the 980, but the 890 is still packed with plenty of good stuff. Want memory mapping – Memory mapping is nearly essential in order for Roomba to navigate multiple rooms or the layout of a large home. Roombas without this feature may find themselves getting lost or stuck in certain spaces. Want pet-friendly brushrolls – Unlike older models which use a central bristle-style brushroll, the Roomba 890 uses two rubber debris extractors that rotate opposite of each other for less tangles and more cleaning. For more information or to buy check out the Roomba 890 on Amazon.com. Should You Buy the Roomba 980? If you simply want the best of the best, the Roomba 980 is the better choice. While the price is certainly higher, if you have a larger home, more messes, or just want to know that Roomba will get the job done without you having to track it down, the 980 model may be the right one for you. Want improved navigation – With iAdapt 2.0, navigation is more logical and the cleaning path operates in straighter lines, most similar to how you would actually vacuum. Want digital map reports – Digital map reports creates a detailed map of where you Roomba goes and basically learns while it cleans. This means less bumps along the way and a smarter vacuum. Want a longer run time – The 980 has a run time of up to 120 minutes on a single charge. In addition, the Recharge & Resume feature allows Roomba to charge up in the middle of a cycle and resume cleaning where it left off once it’s rebooted. This is a great feature for larger homes. For more information or to buy check out the Roomba 980 on Amazon.com.